The fate of your day rests on how you spend the first two hours of your morning. We pride ourselves on being able to work hard, sacrifice when needed and “life hack” our way into a productive existence. We embark on ventures such as starting a business, losing weight (to sculpt that elusive dream body) or even learning a new skill to add to our repertoire. Poorly setting up your morning will inhibit the effective realizations of the above objectives. Does the following scenario sound like you? The sound of an alarm rings, it’s 7.00am. You reflexively bash the snooze button. The previous night was spent watching that captivating new TV series you’ve been streaming on Netflix while browsing news websites online, destroying the self-made promise of increasing your sleeping hours. The alarm rings again, it’s 7.15am. Snooze. By the time you rise from your bed, bleary eyed and irritated – it’s 7.45am and you’re met with a familiar feeling of anxiety that you’ve overslept and will be running late for work. You begin sifting through a pile of clothes, the indecision when choosing your daily attire begins to test your patience. Once you’ve arrived at a decision, you dress yourself and dash to the kitchen. You look at the clock and decide there isn’t enough time to prepare a quick meal; the same conclusion you arrived at the night before when you were about to go to sleep. By the time you get to work at 9am, you’re hungry. Not to worry, there are plenty of places to eat near the office! You buy your usual coffee and decide to grab something quick to eat – a muffin because it looks the most appealing. Your hunger is now satisfied. You arrive at your desk, flustered because you haven’t planned your day and begin to have trouble focusing on your work. I’m not going to present to you another cookie cutter “best morning routine” nor anything you absolutely must be doing. There are enough blogs, podcasts and nutritional preachers who have reaped significant rewards from beating this topic into the ground. What I will do is invite you to review the first two hours of your morning and how it’s spent, as this may be something you have not paid much attention to in the past. In my attempt to aid you, I’ve listed some common approaches you can experiment with. I’ve also listed some resources for you to get started at the end of each section. How much time do you spend planning what to eat in the morning? How about what to wear? Completing these tasks the night before will minimise the cognitive fatigue you’ll experience. On a typical evening, I’ll set everything out for the next morning so I can simply grab what I need and begin my day. This includes preparing tomorrow’s meal, choosing what I’m going to wear and packing my gym bag. No resources required – just get it done. What does your first meal of the day look like? Is it one that you’ve chosen to ignore due to poor time management or do you practice fasting? If you feel that energy is lacking, particularly during the first hour or two of work, addressing this area should be one of your priorities before you leave in the morning. According to a study undertaken by NPD group in 2011, 31 million U.S consumers opted against a morning breakfast. This equated to roughly 1 in 10, with 28% of men aged between 18-34 choosing to forgo this morning meal. This illustrates that breakfast isn’t for everyone. Or we’re lazy. Personally, I love a big meal before I begin working. However, I acknowledge that we’re not all like this. A few years ago, I traveled overseas with a friend who can’t stand the sight of food until well after 10.30am. His patience was tested as I dragged him around the streets of Tokyo looking for somewhere that served a substantial meal in the early hours of the morning. Aesthetically pleasing photo of oatmeal aimed at enticing you. 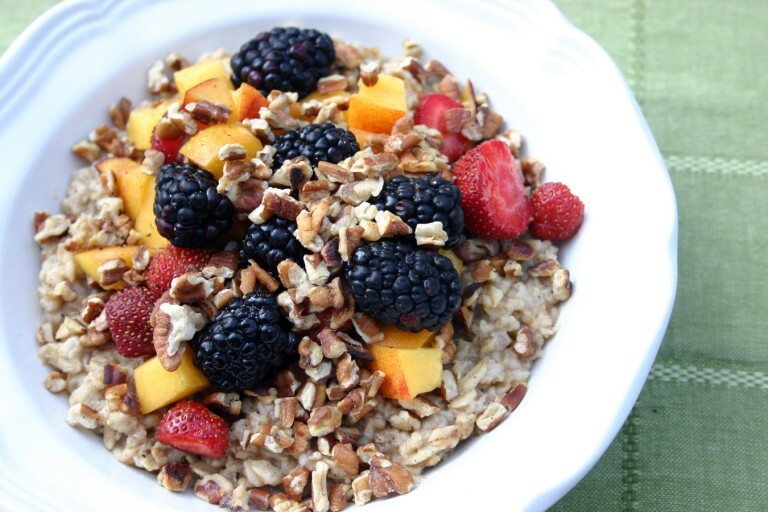 High protein / fiber breakfast ideas (Eggs, yogurt, oatmeal, cottage cheese). I’ve eaten oatmeal most mornings for over four years. Considered a complex carbohydrate source containing starch and fiber, the slower digestion of this food continues supplying your body with glucose (“energy”) over a longer period. Intermittent fasting – If fasting is more your style, here are some approaches you can adopt. I’d recommend the “Leangains” approach. This involves 14-16hrs of fasting with 8-10hrs of eating, closely resembling what would generally be considered a “typical” diet anyway. This is beneficial for weight loss and reducing unnecessary consumption during fasting windows. Preparation of smoothies. If you don’t want to fast and would prefer not to eat, prepare a smoothie. Bodybuilding.com has over 150 available recipes for you to experiment with. 35 Quick and Healthy Breakfast Ideas – Thorough guide on breakfast ideas that take <5 minutes to prepare. Too tired after long working hours to train? Get it done first thing in the morning before the onslaught of social media notifications begin pouring into your smartphone. By training between the hours of 5am-7am, it’s unlikely that you’ll be disturbed. You will not carry a heavy mind burdened by the troubles of the day – you’ll be instead entering into a session with a clean mental slate, theoretically devoid of any fatigue. Warning: the morning workout isn’t for everyone. You’ll be more likely to succeed if your gym is close to where you live, or if a home gym is an investment you’re willing to make. Pact (iPhone / Android) – Put your own cash up as an incentive to cultivate an exercise habit. Sleepytime (iPhone / Android) – Calculate the best time to sleep/wake up, helpful when getting started with morning workouts. In case you haven’t realized, the practice of meditation has gained more mainstream exposure online due to its associated benefits. Is it the life-rejuvenating magic pill that you’ve been looking for? Well, there’s only one way to find out. A common recommendation is meditating for 20 minutes, once a day, in a quiet spot. In my limited experience, I’ve found that sitting on a pillow in a semi-dark room in complete silence works well. I’ve had luck sustaining this practice by limiting it to 10 minutes, every second day and have noticed a negligible improvement, but nothing life defining. Ideally, the result of meditation will help you be present in the moment, hone in your focus on a task and generally feel more at ease. Everyone’s experience differs, and there is no “best” way to do it. If someone claims otherwise, they’re probably after your money. Headspace (iPhone/Android) – Free 10 minute guided meditation sessions to get you started. Noisli.com – Ambient sounds such as rain forests, oceans or wind. Very helpful for concentration when working during the day as well. Sensory deprivation tanks – I’ve experienced these tanks a handful of times and would recommend it. From my experience, it’s like having a psychedelic experience without the psychedelics. No sound, no light, just you and your thoughts. Tim Ferriss on mindfulness (29 mins) – Food for thought on the topic. By employing one or more of the above suggestions, your morning will become something you grow to embrace rather than agonizingly endure. Good luck.